We would like to promote our Spring Camp across your league in the Bantam, Midget A and Midget AA divisions to reach out to any players that would like to pursue the Midget AAA program. The Midget AAA league players are able to play on any team in the league outside of thier current hockey association. The league allows players in the 2002, 2003 and 2004 birth years to tryout as eligible players. Can you post on your website and forward to teams and players across the league our Spring Camp details. 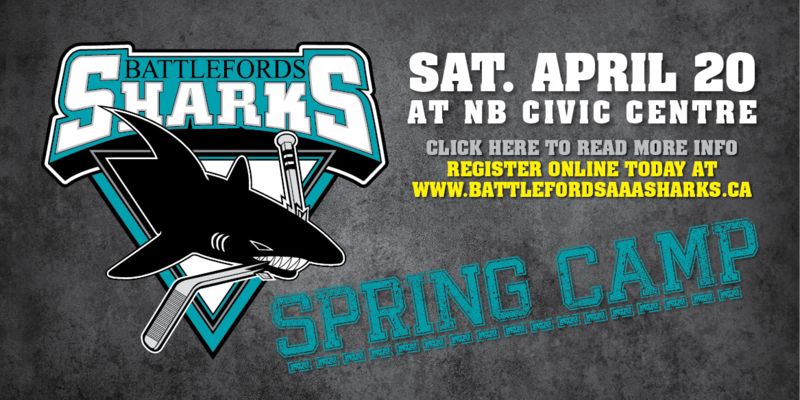 The Battleford AAA Midget Sharks will be hosting their Spring Camp on Saturday April 20th in North Battleford. We are inviting female players born in 2002, 2003 and 2004 who are interested and committed to playing hockey at an elite AAA level. This will be a full day with skill sessions and scrimmages. At the conclusion of the Camp the players will receive feed back from the coaches. Cost to attend is $60. Note: The Battleford Sharks Midget AAA Hockey Program is not attempting to attract or solicit players currently carded with another SFMAAAHL team.